Last Thursday, our representatives had a great turn out at the PHCC Trade show. There were around 30 vendors with at least 150 guests. Our reps reconnected with some plumbers they already knew and met several new contacts. We will be contacting the winners of our raffles today and look forward to building great relationships with our new friends. 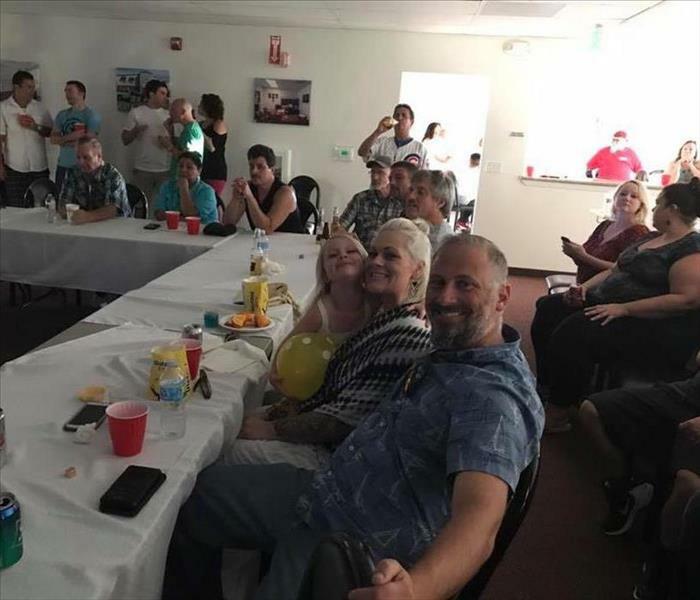 Whether a fan of Mayweather or McGregor, fans of SERVPRO of S. San Rafael/Sausalito had a great time watching this exciting battle between two top fighters from different disciplines. 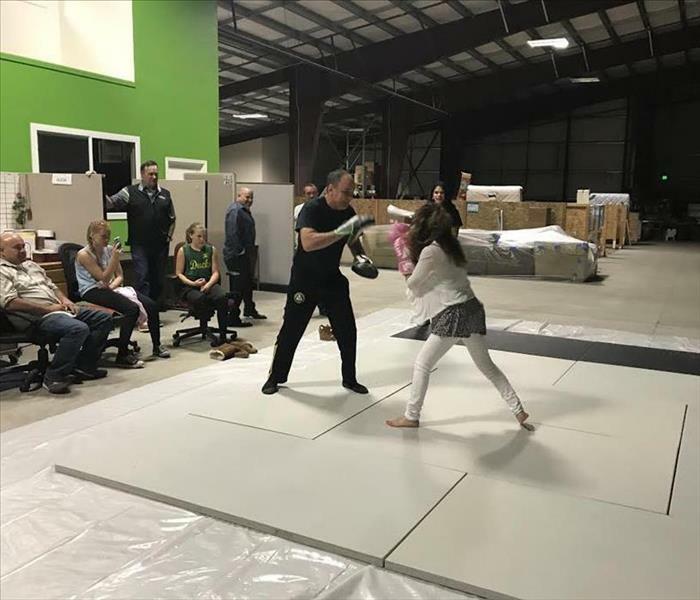 Last Saturday, our SERVPRO franchise hosted "Fight Night" at our Cotati Headquarters in appreciation to our customers, business partners, subcontractors, employees and families. We enjoyed hosting this entertaining event and look forward to inviting our friends at SERVPRO for future events. Our marketing rep Robert and colleague had a great turnout at the Pace BBQ last Friday. 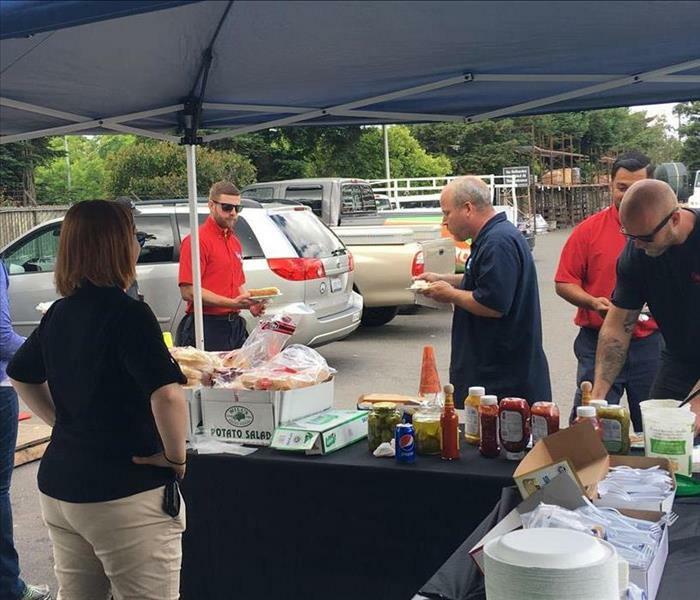 They served burgers and hot dogs to at least 100 hungry plumbers and Pace employees. In addition, there was a drop your business card raffle and the winner was given a visa gift card. Robert also had the chance to advertise for our upcoming Fight Night event in Cotati, which was received well including an RSVP’s on the spot! Management at Pace was extremely pleased with our event and invited us to come back anytime. 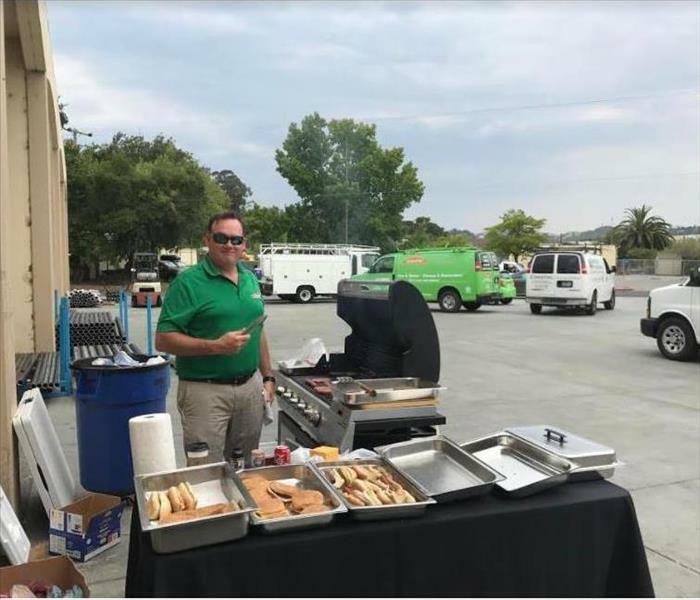 Our Marketing Manager Bryan S. was on the grill at our last event which was held at Pace Supply. He was cooking up hamburgers and hot dogs to serve for the plumber’s appreciation day. 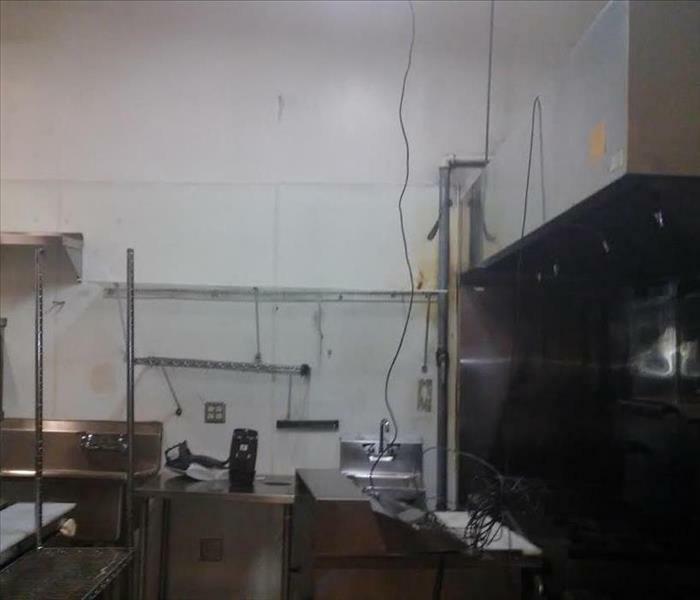 This photo was the result of kitchen fire in a restaurant. 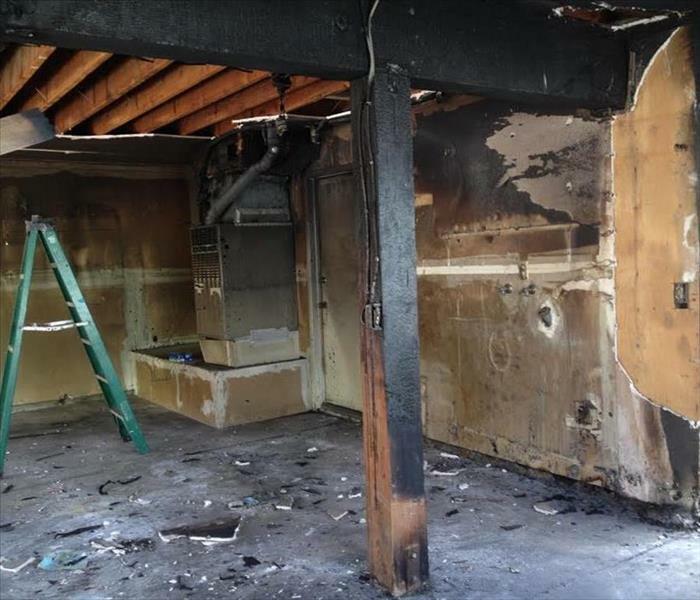 SERVPRO of S. San Rafael/Sausalito was contracted to restore and clean up after the fire damage. After some rebuilding done, our trained technicians work diligently to clean the walls, ceiling and any other surface affected by the fire. 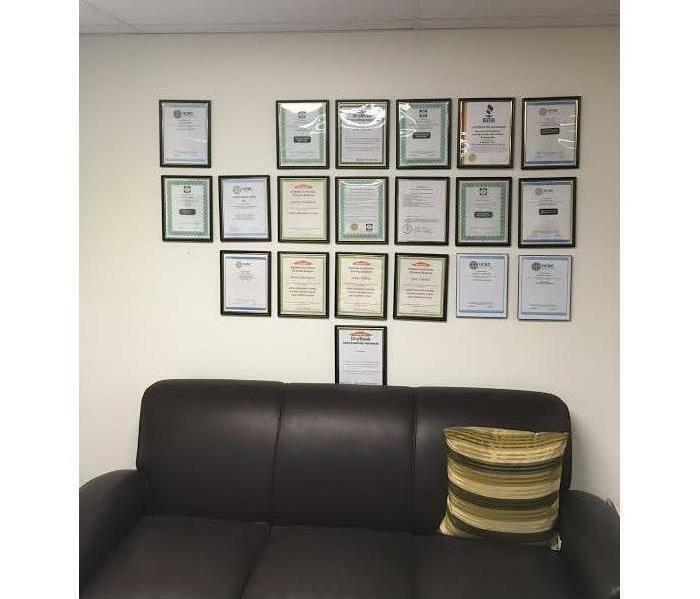 The owner could not believe how quickly we were able to finish the job and get their business back and running in no time. Call SERVPRO of S. San Rafael/Sausalito for all your smoke and soot disasters at (415) 479-2900. Mold can grow as little as 48 hours and can be very destructive. 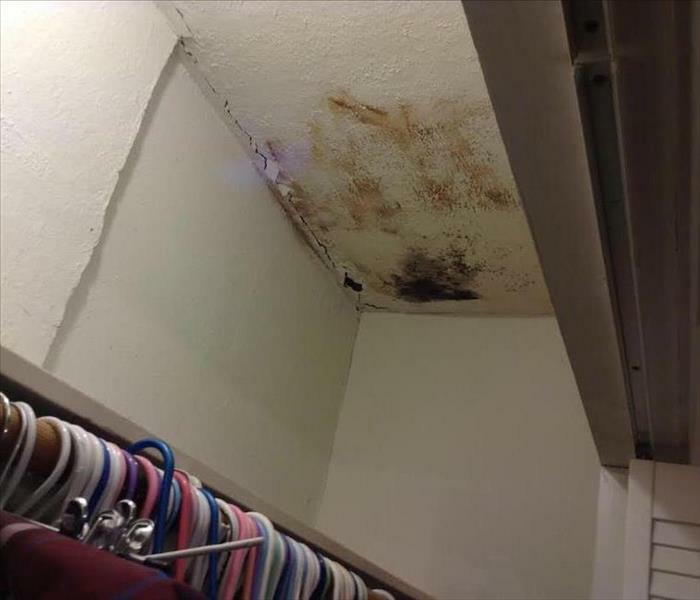 In this situation, the mold damage found in this bedroom closet was a result of a leaky roof. Unfortunately this home was left unattended for period of time which then led high level of moisture turned into a mold problem. 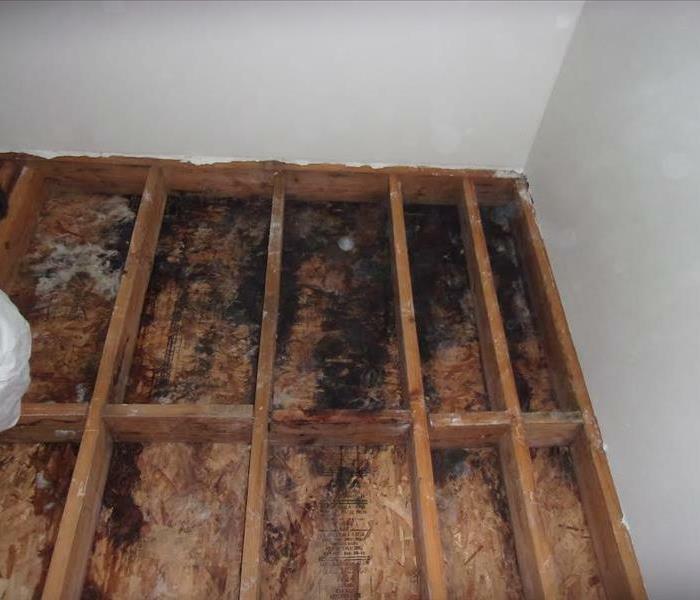 Our customer was in disbelief when they discovered mold spreading throughout the bedroom and hallway of their house. 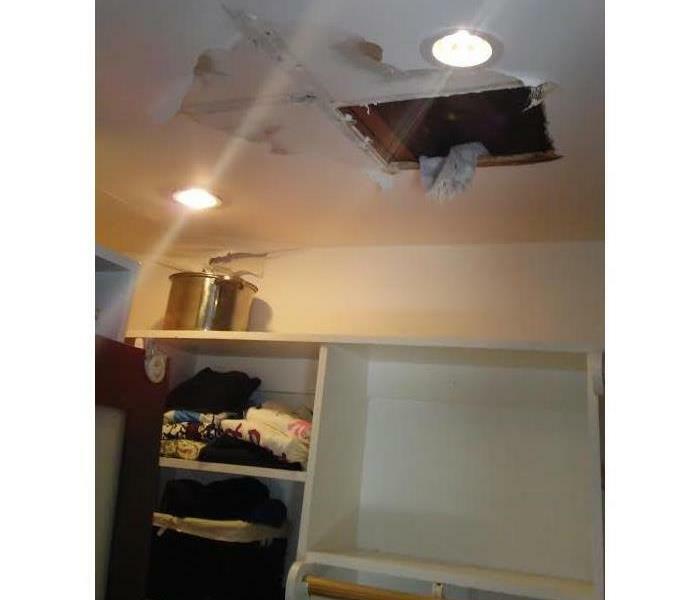 Luckily they called the professionals at SERVPRO of S. San Rafael/Sausalito to handle the job. After a complete inspection, our technicians immediately set up a proper containment by using negative air pressure to keep the mold spores from spreading during the cleanup process. 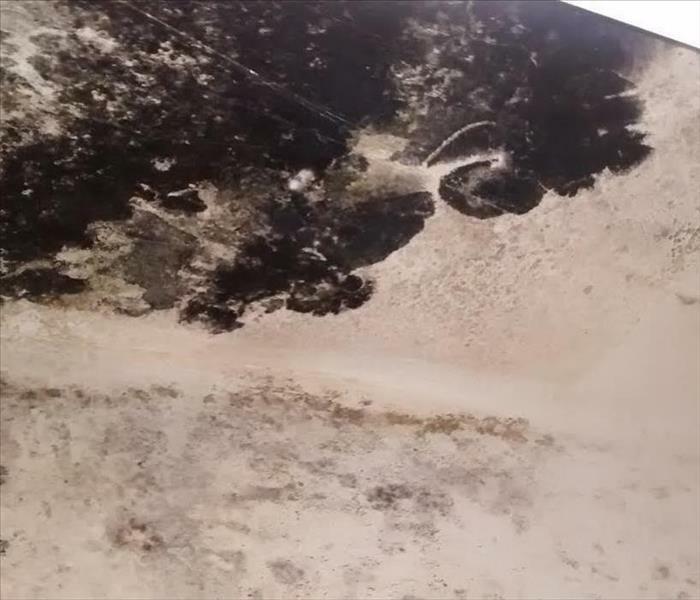 If you suspect mold growth in your home or business, call SERVPRO of S. San Rafael/Sausalito (415) 479-2900. 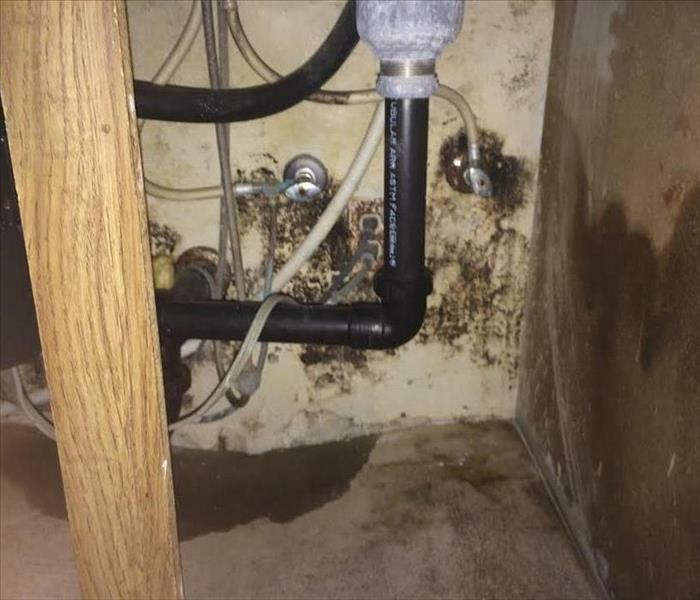 This photo was taken after water damage had flooded the hallway of this residence due to toilet overflow. SERVPRO of S. San Rafael/Sausalito arrived on scene within an hour to perform water mitigation service. In this particular situation, our trained technician quickly extracted the contaminants, used the proper drying equipment and treated the affected areas with disinfectants and deodorization. Call SERVPRO of S. San Rafael/Sausalito at (415) 479-2900 for all your water emergency needs. 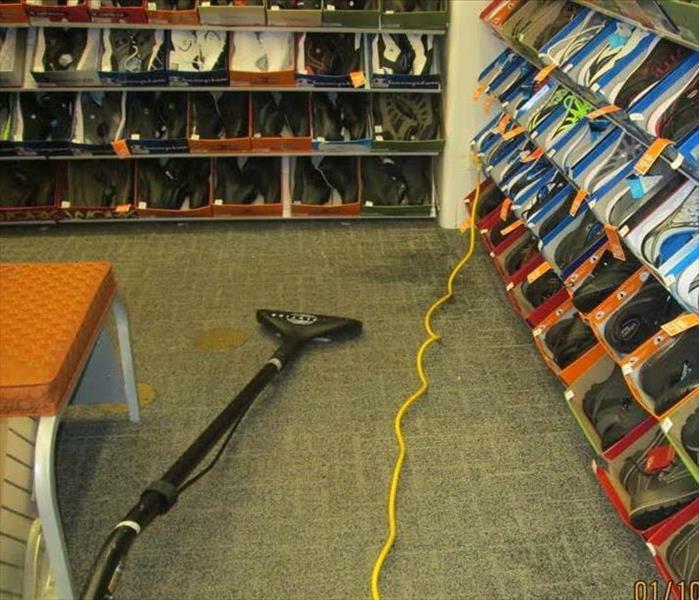 This photo was taken inside a shoe store after water had leak due to a broken air conditioning. Both the sales floor and back room were affected and the store manager was concerned about it starting to smell if left untreated. SERVPRO of S.San Rafael/Sausalito was called to extract the water and dry the structure. But first our crew had decided to remove the carpet, baseboard and lower drywall to completely dry the affected areas. The store was able to open and operating with minimal interruption. 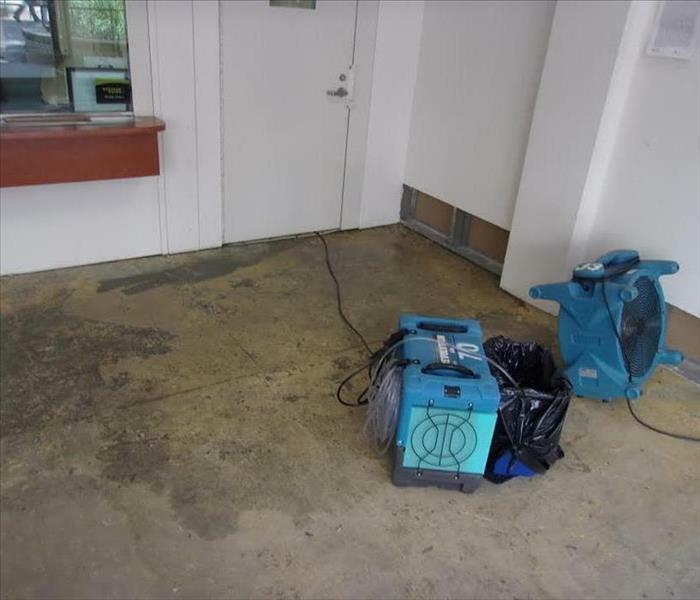 If you have had experience with water damage to your business, SERVPRO of S.San Rafael/Sausalito is Here to Help and we're just a phone call away (415) 479-2900. The owner of this home in Berkeley called SERVPRO of S.San Rafael/Sausalito after a leak had caused water and mold damage on their ceiling. Due to the home being unoccupied, the owner was surprised to discover significant amount of mold damage in various parts of their home. Once the roof leak had been fixed, our technicians performed proper containment to avoid cross contaminating the unaffected areas. Our technicians used moisture monitoring equipment to effectively measure and document the drying process, removed the affected materials and completely dry the structure. If you suspect you have a mold problem, give SERVPRO of S.San Rafael/Sausalito a call (415) 479-2900. We’re always Here to Help! The fire damage to this Richmond home was caused by an electrical malfunction in the attic. Fortunately no one was hurt during the incident. 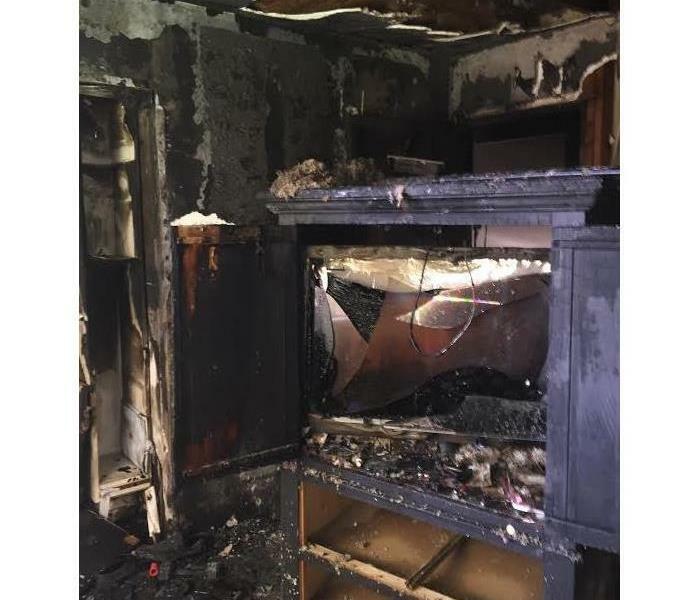 When our crew arrived at the scene, there was tremendous amount of fire damage in this bedroom including the kitchen and living room of this house. 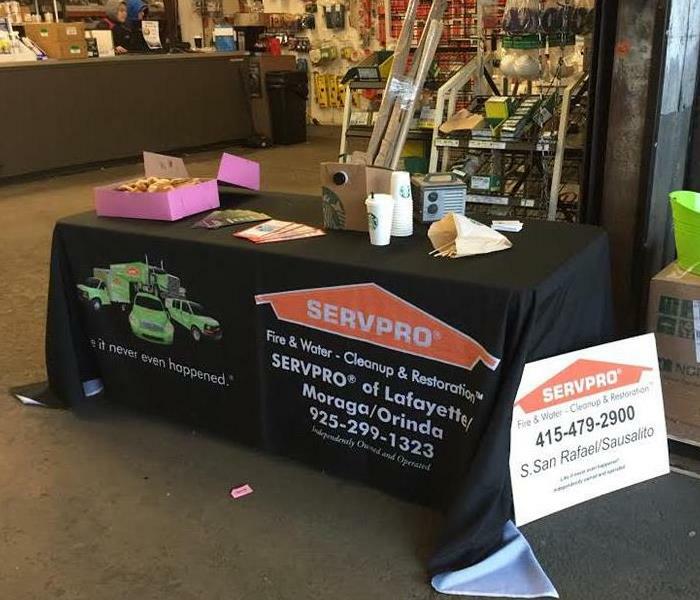 After a thorough assessment of the extent damage, our highly trained technicians at SERVPRO of S.San Rafael/Sausalito were able to remove the smoke and soot damage using chemical commercial products and sponges. Standing pools of water were quickly extracted and the affected areas were completely dried and sanitized. Call SERVPRO of S.San Rafael/Sausalito for all your smoke and soot disasters at (415) 479-2900. This picture was taken shortly after mold cleaning was performed by our technicians. This was a result of a roof leak from heavy spring rain. The water had seeped through a hole onto the ceiling for quite some time. 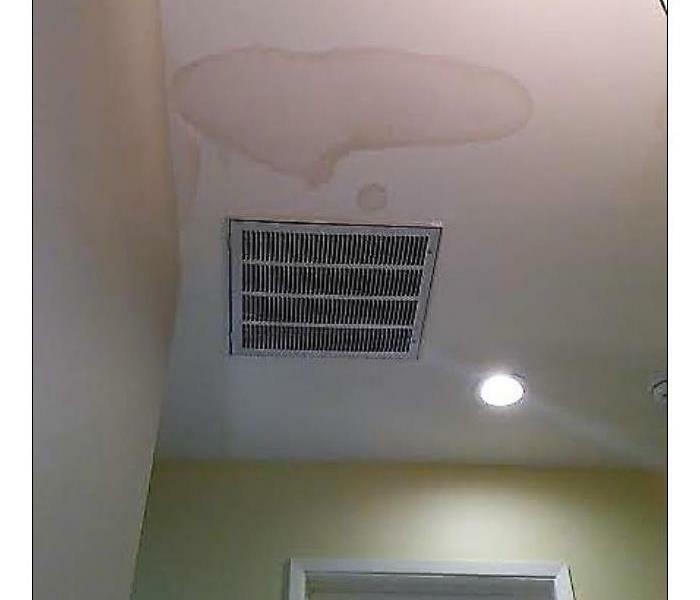 By the time the owner notice the water dripping, the drywall was completely saturated. 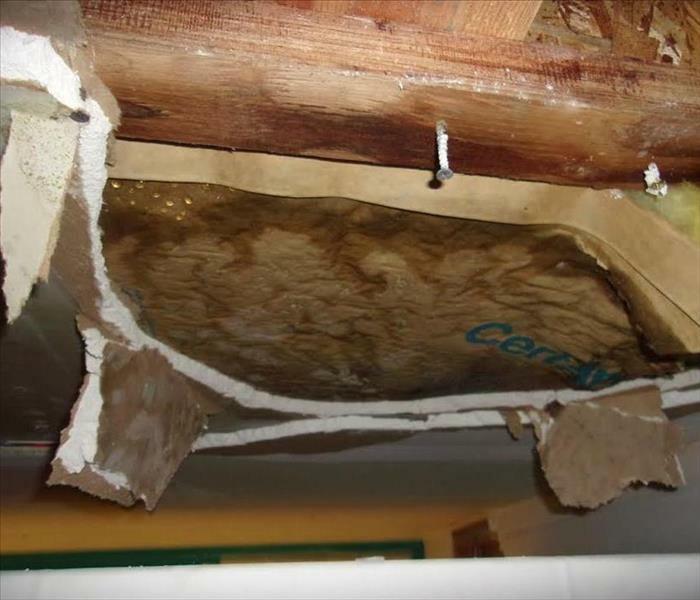 Once the roof was fixed, our technicians removed the drywall and insulation and treated the affected areas as needed. If you have had the unfortunate water damage to your home or business, call SERVPRO of S.San Rafael/Sausalito at (415) 479-2900. Our highly trained technicians has the knowledge and expertise to handle any size disaster. SERVPRO of S.San Rafael/Sausalito was called to this house to perform water mitigation service. After fire was put out, firefighters saw smoke coming from an exterior wall of this house, they opened the walls and found smoldering fire, which they then put out. After the fire trucks leave, the house suffered extensive water damage. When our technicians arrived on scene they extracted excess amount of water and removed the carpet and padding in order to dry the subfloor. Call SERVPRO of S.San Rafael/Sausalito at (415) 415-2900 for all your water emergency needs. This past Friday's barbecue at Santa Rosa PACE Supply was a huge success! Over 200 people attended, including plumbers, fire suppression experts, engineers, and contractors. We had a blast reconnecting with some of our old friends and saw some new faces as well. We will be contacting the winners of our raffle within the next few days and are excited to continue working with all who attended! This demonstration photo of Jiu Jitsu was taken before the MMA fight night event in our warehouse. Our SERVPRO crews, plumbers and friends had a wonderful time learning the combat sport system that focuses on grappling and especially ground fighting. 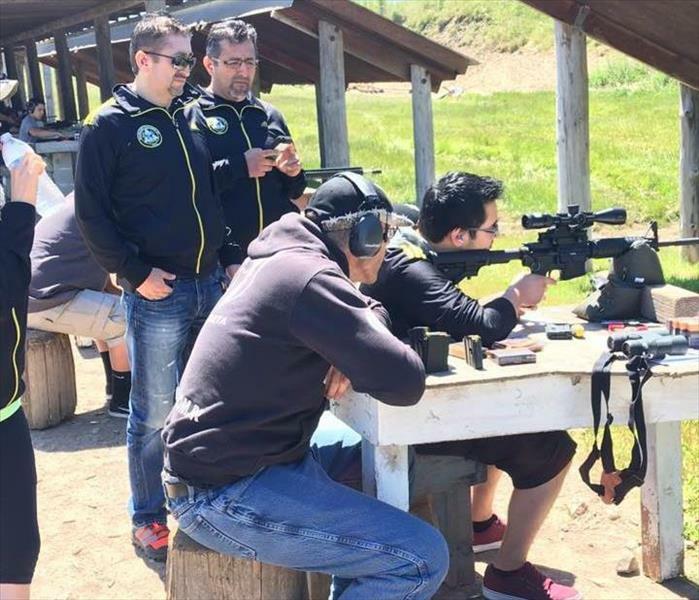 This photo was taken at the Circle S Ranch & Outdoor shooting range. 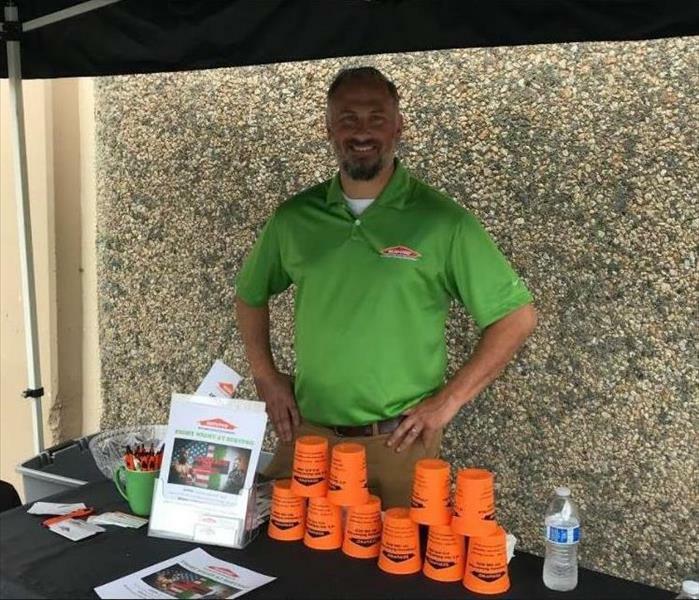 Our SERVPRO staff had a wonderful time meeting new people and reconnecting with some previous clients and friends. It was perfect fun and educational way to spend a sunny afternoon on the range. 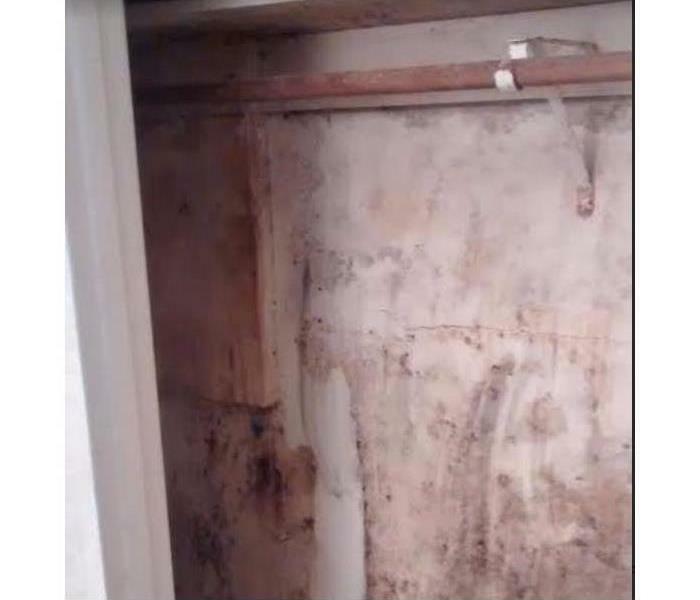 This photo was taken after mold was found under the sink due to a broken pipe. The slow leak had been going for unknown period of time and by the time it was noticed, there was quite a bit of mold growth. 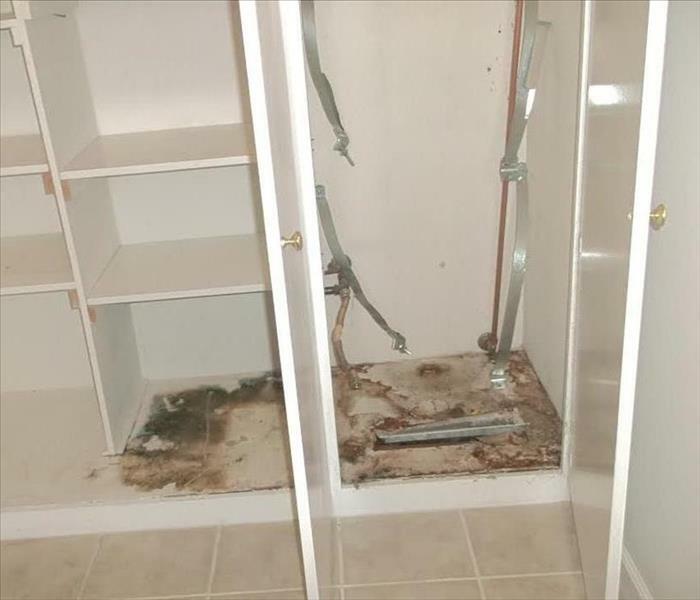 After the customer had the leak fixed, our crew performed mold remediation and cleanup service. The sink was back to normal and job was completed in no time. If you have had a leak call SERVPRO of S.San Rafael/Sausalito at (415) 479-2900. 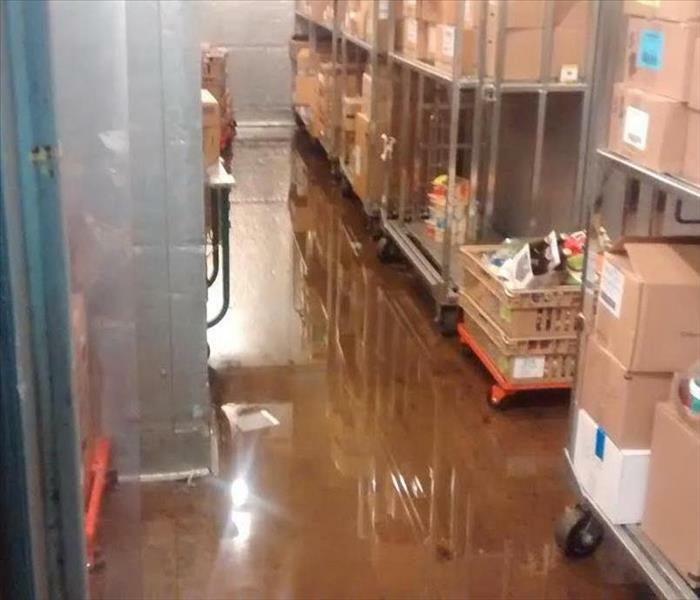 This flooded backroom at a grocery store was a result of heavy rainstorm. This picture was taken after an employee noticed the flood upon returning to work on a Monday morning. SERVPRO of S.San Rafael/Sausalito was called out to extract water, sanitized and placed drying equipment to dry the surface. Call SERVPRO of S.San Rafael/Sausalito for all your emergency needs at (415) 479-2900. 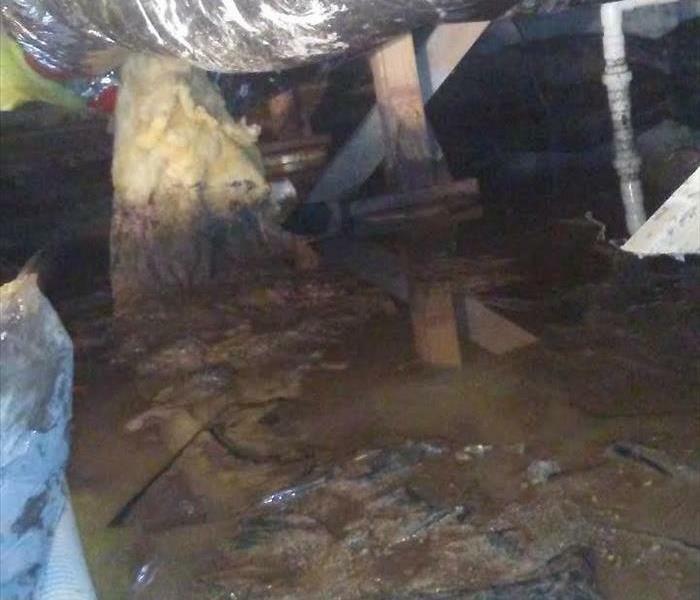 This photo was taken after a water heater in the attic slowly leak through the ceiling. There was significant water stains on the ceiling which had been left unattended for a period of time. 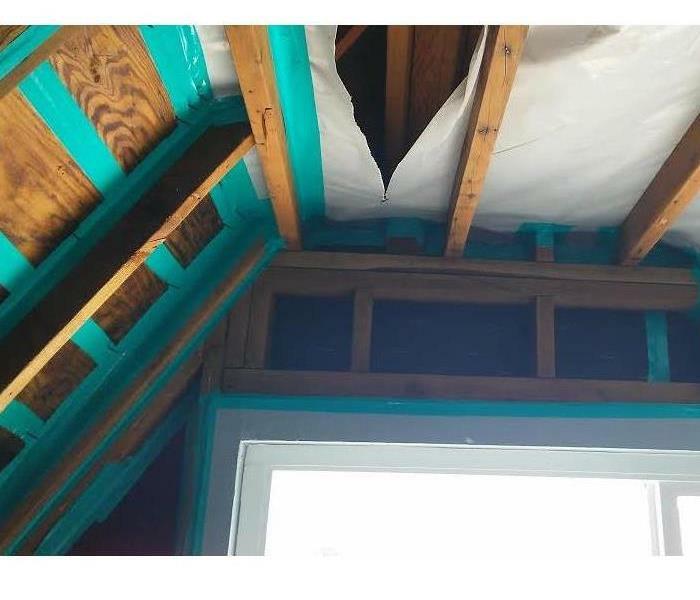 When our crew arrived at the scene, they decided that they could dry the walls by simply removing insulation in the attic and base board in the hallway to ventilate wall cavity. The area was treated with anti-microbial product to prevent microbial growth and drying equipment was placed. Call SERVPRO of S.San Rafael/Sausalito at (415) 479-2900 for all your water emergency needs. This home owner called SERVPRO of S.San Rafael/Sausalito after a roof leak had caused water and mold damage onto the ceiling in a closet. The leak was small and slow which took months before the owner noticed the mold growth. Upon containment, our crew applied the proper techniques to remove the mold and dry the structure following proper mold guidelines. Call SERVPRO of S.San Rafael/Sausalito (415) 479-2900 for all your mold remediation needs. 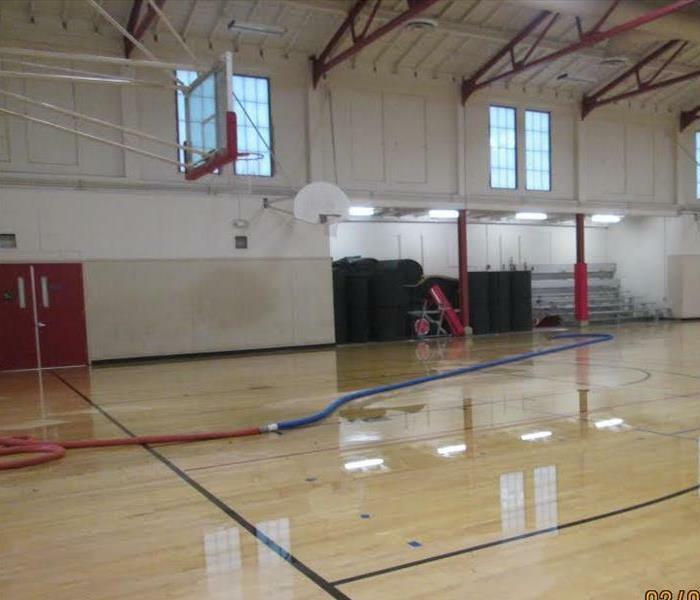 This photo was taken after a heavy rain storm had flooded this school gym in San Rafael. 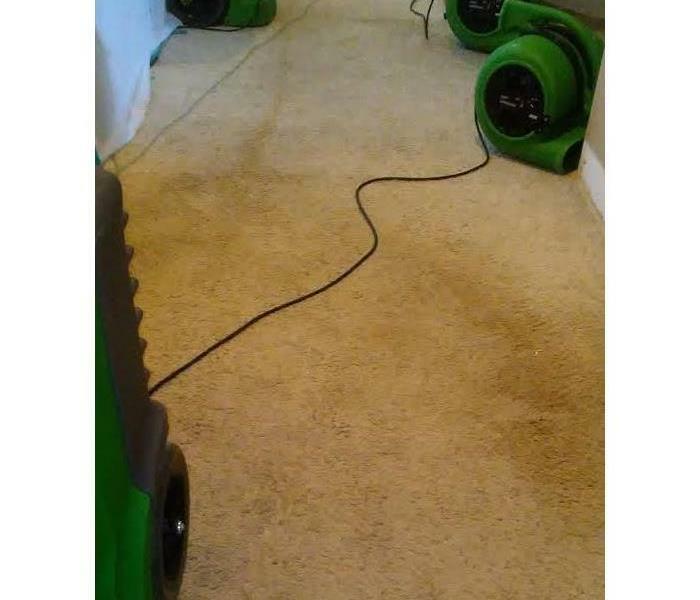 SERVPRO of S.San Rafael/Sausalito was hired immediately to remove the water by using advanced equipment and scientific drying techniques. All monitoring, drying, and work were done after school hours to avoid interruptions. Call SERVPRO S.San Rafael/Sausalito today at (415) 479-2900 and let us help you with your water emergency. 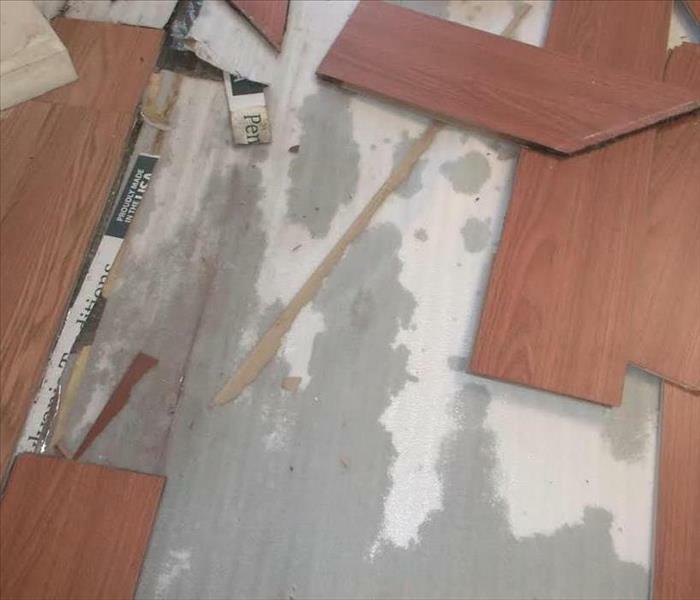 This photo was taken after water damage had broken up this hardwood floor due to a water heater leak. Notice the extent of damage caused by bound water, which is the water that has been absorbed into the materials. Our technicians extracted the water, dried the affected areas and placed the proper drying equipment. 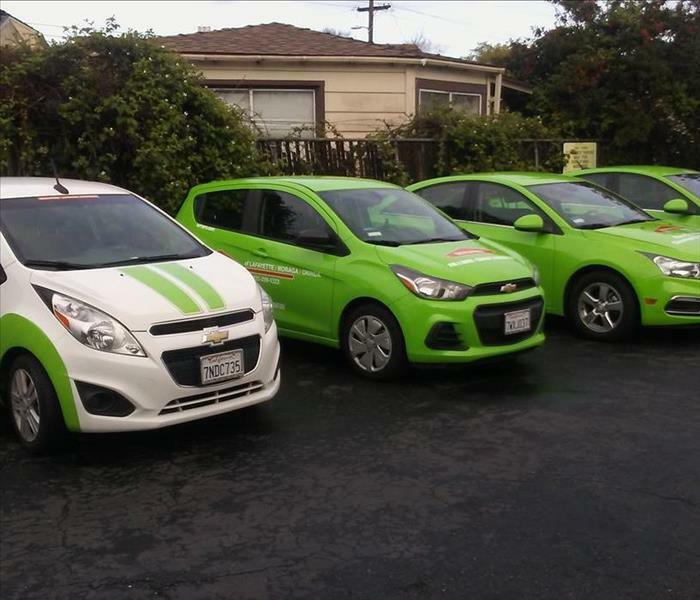 SERVPRO of S.San Rafael/Sausalito is available 24 hours a day and 7 days a week. Should you have water damage to your home or business, you can trust our professionals to get the job done. Call us today at (415) 479-2900. We’re always Here to Help! 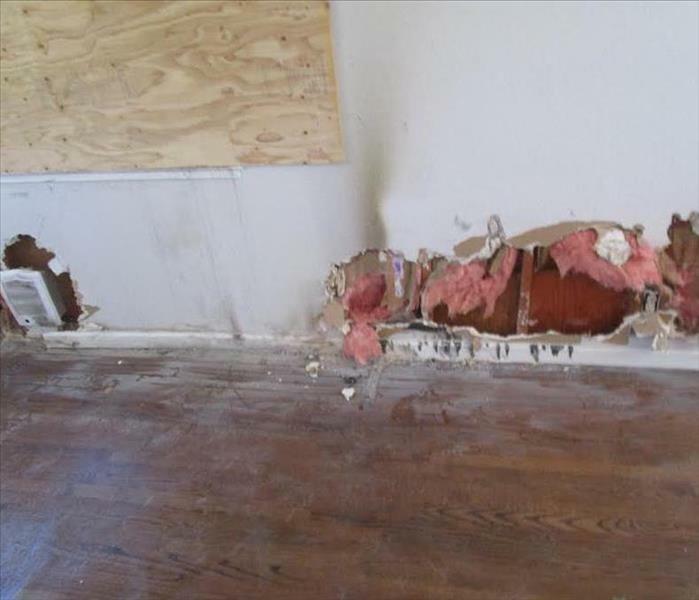 The mold found inside this wall was a result of a water leak from a light fixture that went undetected for weeks. Our crew discovered significant amount of mold damage upon inspection. They use various containment procedures to prevent the spread of mold before treating the affected materials. If you are dealing with mold problem call SERVPRO of S.San Rafael/Sausalito at (415) 479-2900. We have the training, equipment, and expertise to remediate your mold infestation. 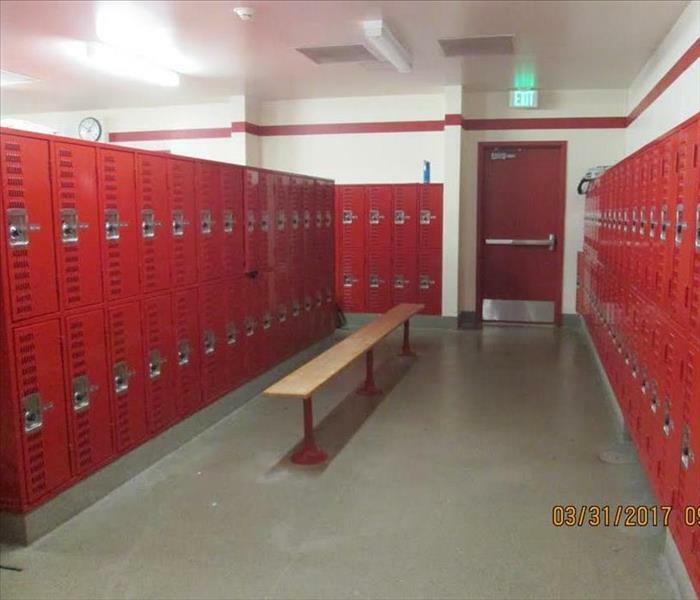 This flooded locker room in San Rafael was a result of ongoing rainstorm that lasted for several days. SERVPRO of S. San Rafael/Sausalito was contracted to extract gallons of water. Once the affected areas had been treated with disinfectant, dehumidifiers and air movers was placed on site to dry the affected areas. The property manager couldn't believe how quickly and completely we were able to get the property dry and back to pre-storm condition. Our professionals make disasters, "Like it never even happened." 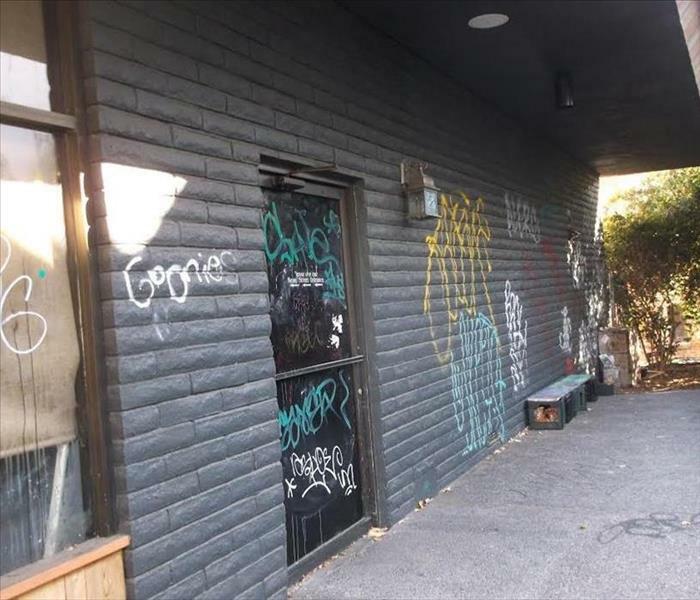 SERVPRO of S.San Rafael/Sausalito was hired to remove the spray-painted graffiti due to vandalism. When our technician arrived they found graffiti all around the exterior walls of this building. Since the owner had plan on renting the space he requested that we remove the graffiti as quickly as possible. Our technicians was able to clean, pressure spray and remove the graffiti in no time. If you have had problem with vandalism or graffiti to your property, call SERVPRO of S.San Rafael/Sausalito at (415) 479-2900 and let our trained professionals help you. 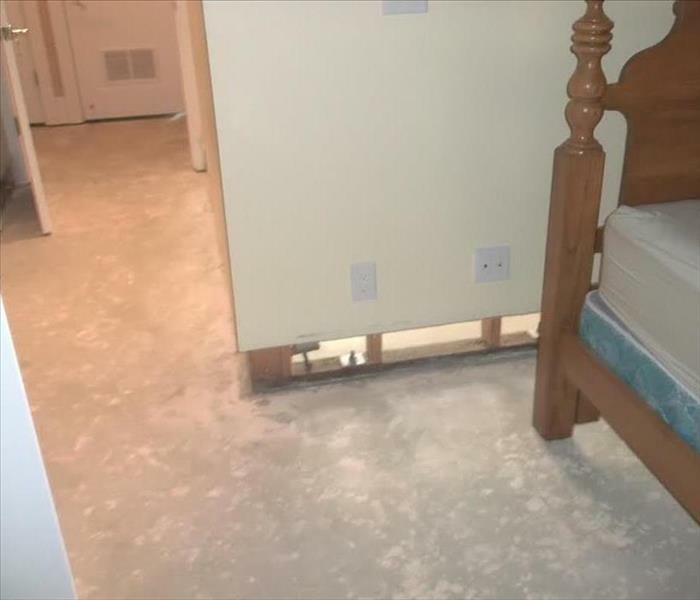 The owner of this home hired SERVPRO of S.San Rafael/Sausalito to extract the water out from the bedroom, hallway and bathroom due to a sewage backup. Upon inspection, the water loss was classified as category 3. This means that water is grossly contaminated and can contain pathogenic and other harmful agents. If not dealt with there is the potential for toxic mold growth. Our technicians extracted all the contaminants from each of the rooms, treated the floors and affected drywall with antimicrobial disinfectant following the IICRC guidelines. This was the aftermath of a flooded crawlspace in Lafayette due to excessive water from the rainstorm. SERVPRO of S.San Rafael/Sausalito was contacted to extract the water but Fire Dept had already extracted some of the water out when our crew arrived at the scene. Once the vapor barrier was removed and replaced, absorbent was utilized to dry the excess water. If you experience flooding in your area, give SERVPRO of S.San Rafael/Sausalito a call at (415) 479-2900. We're here to help with your water emergency service needs. This photo was taken in the lobby of a church in Oakland, CA. Our crew performed water mitigation services due to hot water heater that burst and caused structural damages to 4 rooms in this building. We placed the proper drying equipment to the first and second level of the church and monitor the drying process to make sure it is dry. 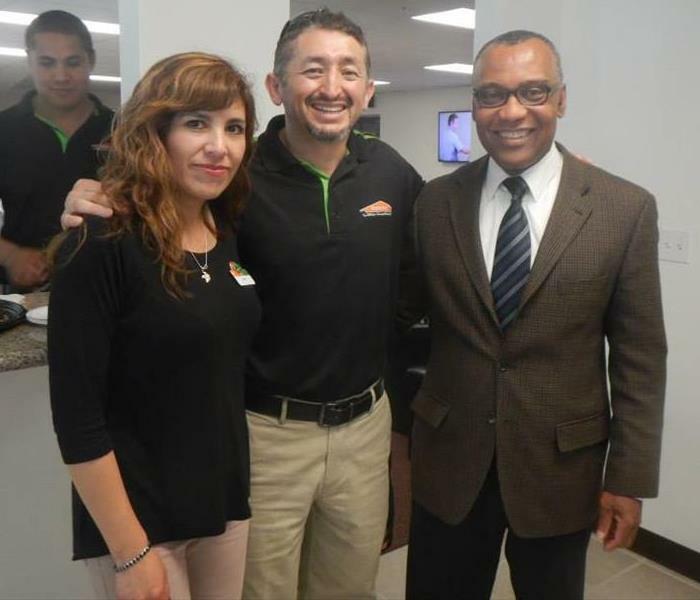 If you experience water damage at your home or office, call SERVPRO of S. San Rafael/Sausalito at (415) 479-2900. This was the aftermath of a garage fire in Hayward, CA. When our technician arrived on the scene, there was significant smoke, soot and structural damage throughout the home. The owner was surprise how quickly and completely we were able to clean the soot from the walls and ceiling. We make disasters, "Like it never even happened." 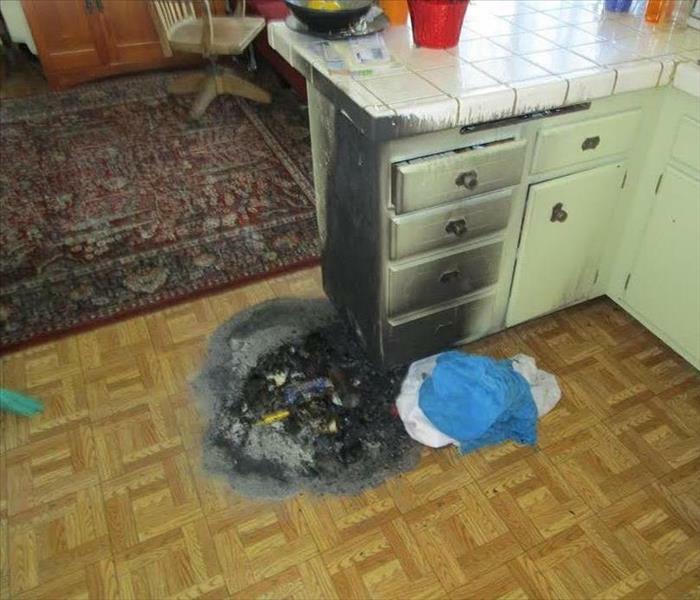 Call us at (415) 479-2900 to discuss fire restoration and cleanup services. This photo was taken in front of a financial institution building after a sewer backup nearby. During the incident, the bathroom drain pipes and toilet were overflowing with contaminant wastewater. Upon receiving the call from the owner, our technician quickly performed containment of the affected areas and safely remove biohazards and dispose of them properly in accordance with OSHA and health regulations. Call SERVPRO of S. San Rafael/Sausalito at (415) 479-2900 for all your water emergency needs. The owner of this house was in disbelief when they discovered fire damage into their kitchen. 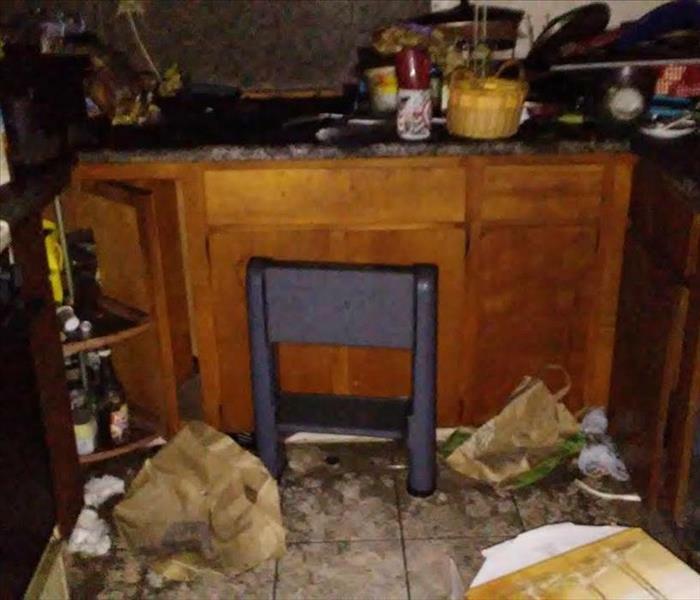 The small fire that ignited inside the garbage burned several inches deep in the kitchen floor. Our technicians was hired and quickly responded to the scene. They cleaned the soot and smoke damage and made it, "Like it never even happened." 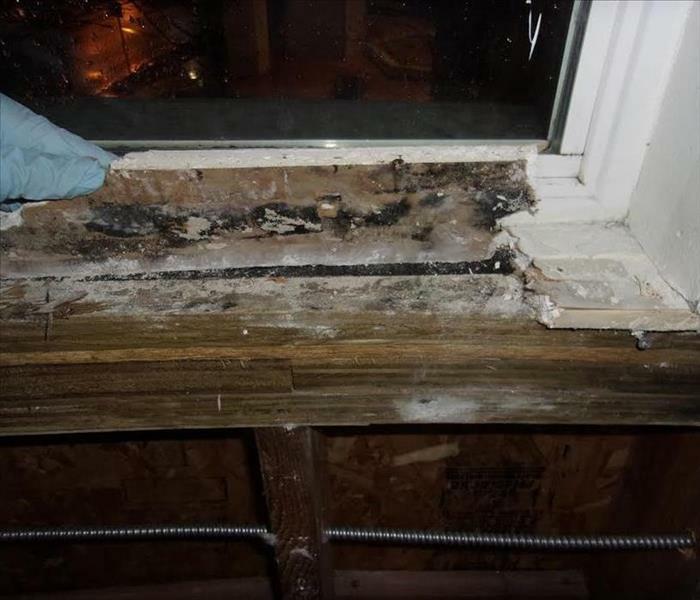 The water damage in this apartment building was a result of a rook leak due to heavy rainstorm. The water had accumulated and traveled through the drywall and insulation making the ceiling collapse on to the floor. Our technician was hired by the property manager to perform an emergency water service. Upon arrival, our crews inspected the area and found the source of the water leak. They extracted the water and replaced the damaged materials in a timely fashion. 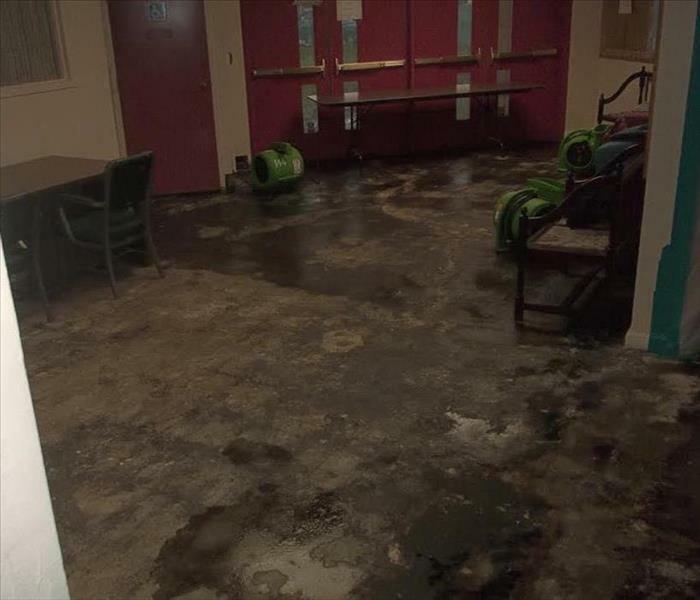 If you experience water damage call SERVPRO of S. San Rafael/Sausalito at (415) 479-2900. We're here to help for all your water emergency needs. 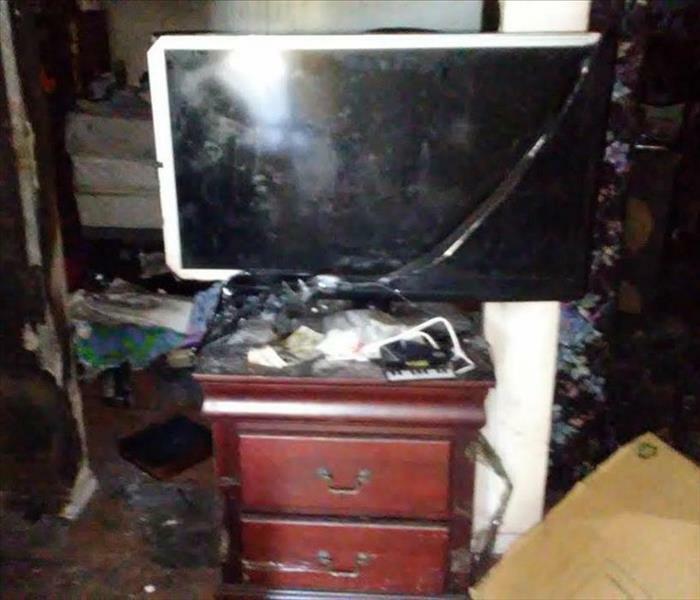 The photo shown above was the aftermath of a bedroom fire in Alameda, CA. The fire started at the upstairs den caused by an overloaded power surge strip. Unfortunately, the fire was so destructive that it also affected the hallway area of this house with soot and smoke damage. Our customer was expecting a much longer process but our crew was able to restore and rebuild their home in no time. This photo was taken after a fire damage outside the wood fence of this home. Due to severe structural damage, the wood fence had to be reconstructed and fully restored. Unfortunately fire is destructive and sometimes requires rebuilding. Good news! We can provide both. 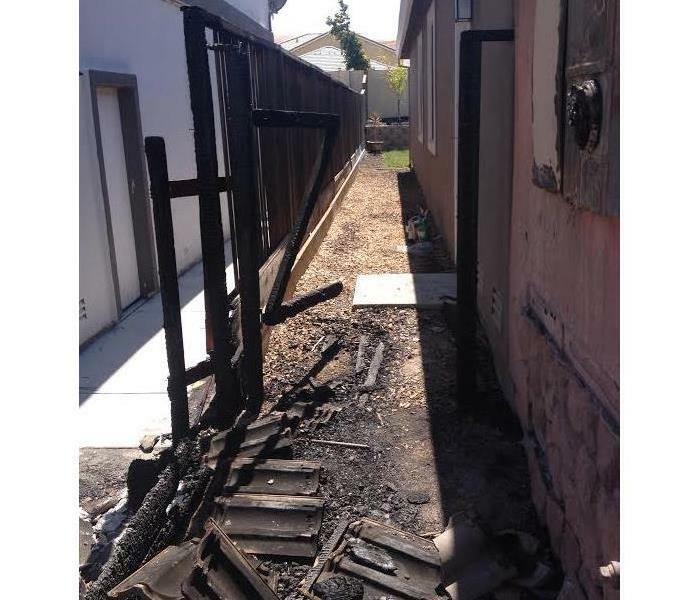 Call us at (415) 479-2900 to discuss fire restoration and reconstruction services. 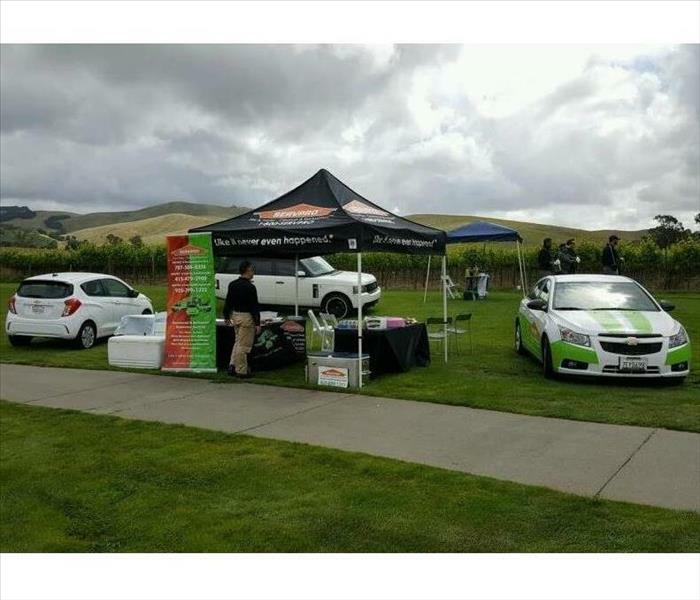 Our SERVPRO representative German G had a wonderful time sponsoring the 11th hole to Peninsula Gujurati Associations at the Chardonnay Golf Course. He was delighted to serve complimentary refreshments and advertise our services afterwards. 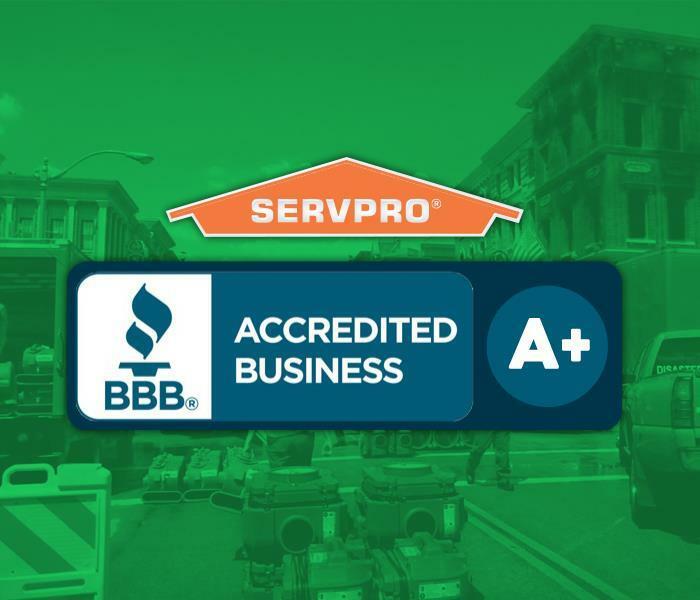 As a national leader in the Restoration Industry, SERVPRO is known for getting the job done professionally and consistently. 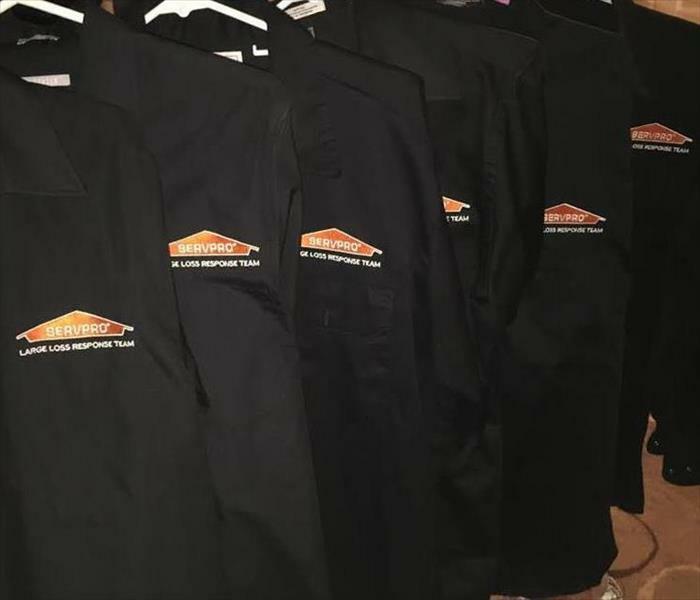 From our crisp Uniforms to our training, our SERVPRO professionals are always ready to help! These vehicles allow our account representatives to reach out to clients and educate them on how to prepare and respond to emergency situation. They are a wealth of knowledge to provide our communities important information about emergency preparedness and response. If you see us on the road, don't forget to wave at us and write our information down. We are a team of trusted restoration specialist to make disasters, "Like it never even happened." SERVPRO of South San Rafael/Sausalito is proud to have highly trained staff who are qualified through education and examination. 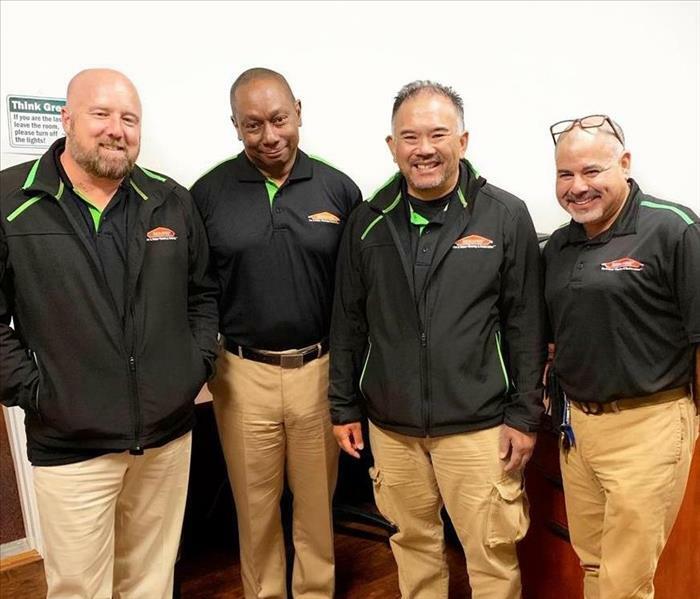 From initial and ongoing training at SERVPRO’s Corporate Training Facility to regular IICRC industry certifications, rest assured our staff is equipped with the knowledge to restore your property and make it, "Like it never even happened." 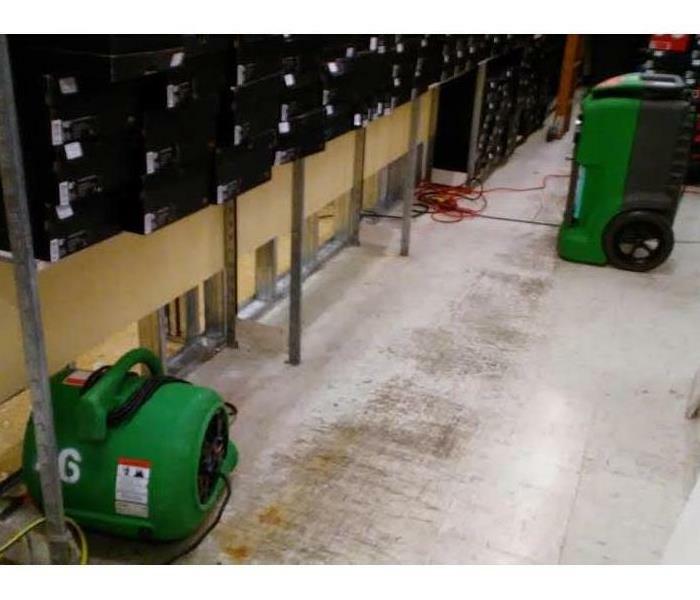 The water damage in this shoe store was a result of water paddling and back flowing into the building due to heavy rainfall. Unfortunately the water was forced into the building affecting three rooms in the store. Our technicians responded within an hour to extract the water. They closely monitor using moisture meters, document the drying process to make sure drying and remediation standards are met. SERVPRO of S. San Rafael/Sausalito is close by and ready to respond to your flood or water damage emergency, call us today (415) 479-2900. 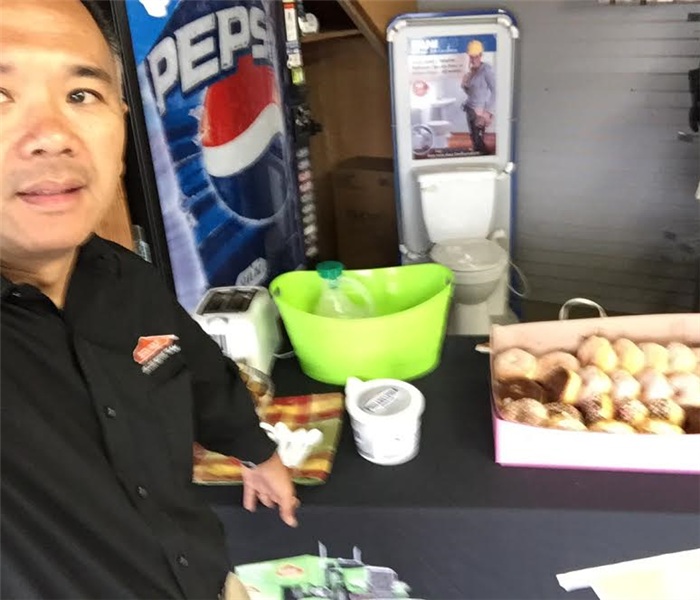 Our Marketing Rep Robert C showed up early at Rubenstein's Plumbing Supply to serve some delicious donuts and hot coffee. He had a wonderful time getting to know the plumbers. Our SERVPRO Marketing Reps Jason and German participated in the Annual Ed Miller Memorial Toy Drive event this past Saturday. It was an eventful weekend where they had a wonderful time socializing with a friendly group of people at the local Fireman's meeting place, shooting darts in a tournament and a big toast in memory of Ed Miller. 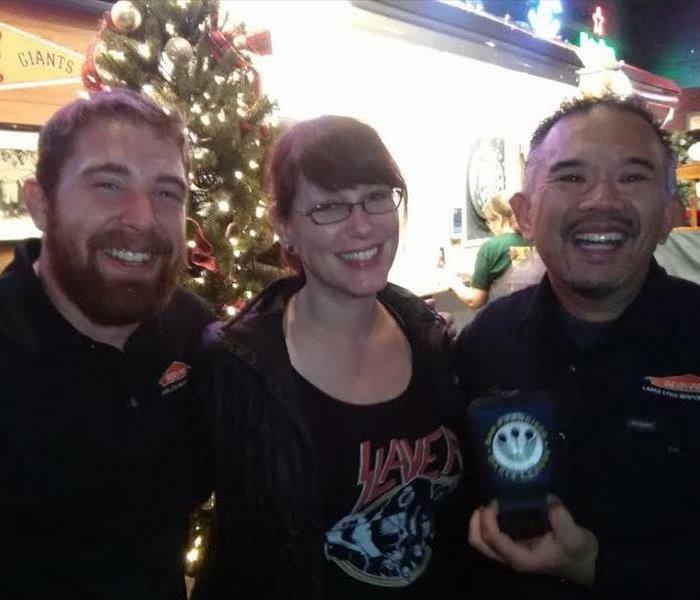 Best of all, our reps were able to help raise funds from donations and collected toys to benefit the SF Firefighter Toy Drive. 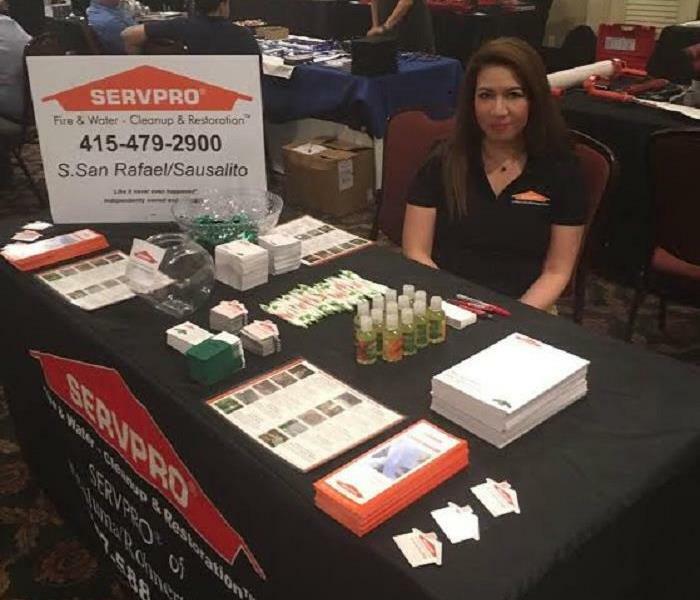 Our SERVPRO Marketing rep Josephine V. had a wonderful time meeting potential new clients and showcasing her event space at the PHCC of the Redwood Empire Tradeshow in San Rafael. 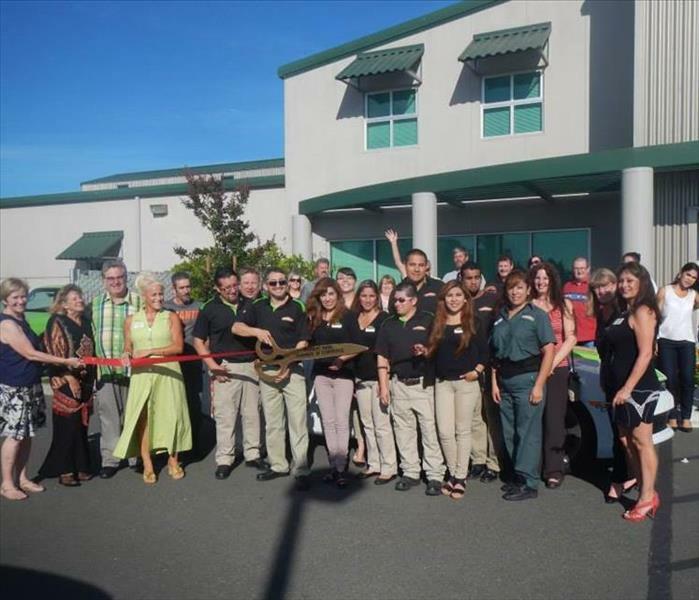 A great shot of Jenny and Jesus with council member of Rohnert Park who have joined us for our ribbon cutting. We were honored by his support and participation to this event. 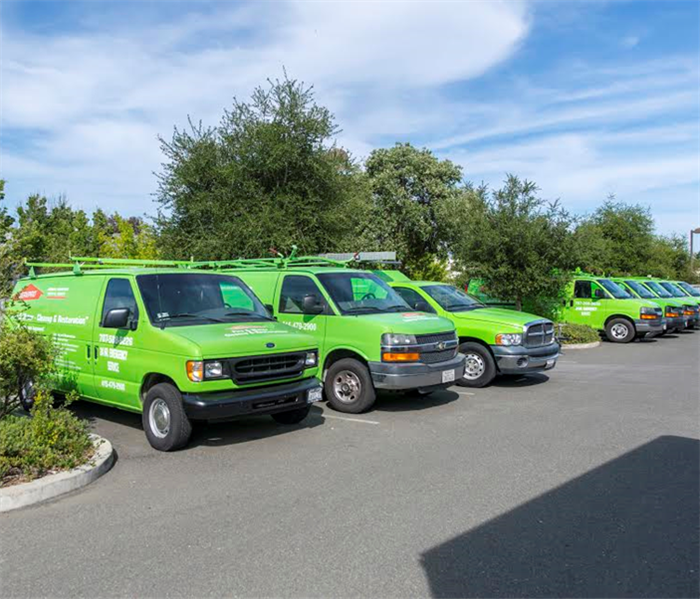 For many years, SERVPRO of Petaluma/Rohnert Park has been the local restoration vendor in communities around the country. Our results have earned the trust of insurance companies as well as countless home and business owners. 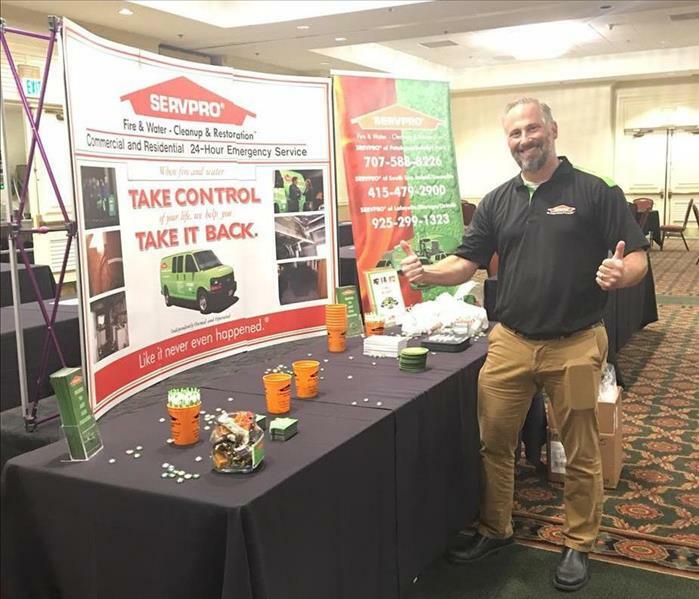 SERVPRO professionals are highly trained to clean businesses, homes and belongings after fire and water disasters, '"Like it never even happened! These reliable vehicles of ours are ready to provide you the restoration service you need in case of Fire, Smoke, Water and Mold damages in your area. Rest assured our fleet is ready to strike as soon as disaster happen! Our technicians are always here to help restore your damages "Like it never even happened." Our SERVPRO Rep, German G. was delighted to serve our complimentary breakfast at Standard Plumbing. A great way to start the day with fresh coffee and delicious donuts. This is the SERVPRO way! 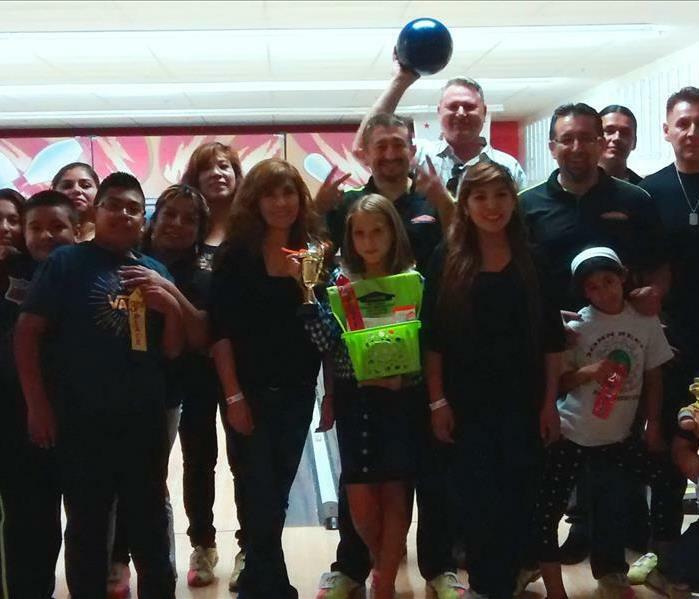 This was our company bowling party with President and CEO's, team members, family and friends enjoying at Double Decker Lanes in Rohnert Park! We look forward to spending more time in our community and next years event!